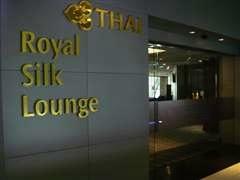 What should you do if you have a Bangkok airport flight delay or maybe a few hours to kill before your connecting flight? 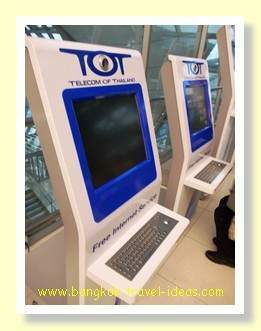 Well, here are some travel tips to help you fill in the time at Suvarnabhumi Airport whilst you are waiting for your plane to become available. In fact there really is quite a lot to keep you occupied in Suvarnabhumi Airport, and before you know it, you will be on your way again. The Chang Foot Massage and Spa centre is located on the third floor at concourse A and G on Level 3. Here you can relax with their full range of massage services, have a foot massage, manicure or pedicure or take a sauna. Pricing is extremely reasonable and you are going to feel so refreshed afterwards that your flight delay will become a distant memory. 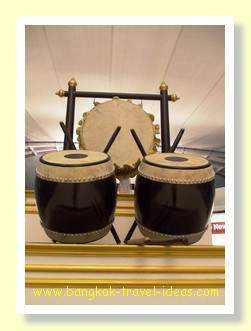 Without a doubt The Chang Foot Massage and Spa is one of the most popular places in Bangkok airport and attracts a great deal of attention on this website. If you need to take a shower in Bangkok Airport then ask at the desk. If you don't have the chance to leave the airport then the Miracle Tavern formerly Louis' Tavern Day rooms are available inside the airport at two locations. The day rooms area a really convenient option if you need to a rest or have a shower between flights. This choice is very popular with international travellers, especially at night and it may not be available at short notice. If you want to know more then visit the Agoda website to learn more about the Miracle Tavern Dayrooms at Bangkok Suvarnabhumi Airport. Here you can get up to day pricing and also see some very nice and enticing photographs of the day rooms. Priority Pass, is the world's largest independent airport lounge program and if you are a member then you will be entitled to use the following lounges in Bangkok Airport. If you are not already a member, but are interested in what they have to offer, then visit the Priority Pass website, to find out further information, as they have more than 600 lounges around the world. You probably don't need me to tell you about your own airline lounge. If you have are a frequent flier then you will be well aware of what your lounge has to offer and would have been given the information at check-in. However don't forget that some of them are set up with shower rooms, so if you encounter a flight delay and need to freshen up, you can go and take a relaxing shower. Look on the third floor for your airline lounge but note that opening hours are generally 05:30 am - midnight. Additionally Thai Airways have a complimentary Spa and Massage facility located just opposite from the First Class lounge. There is a choice of either a neck and shoulder massage or foot massage and you can enjoy being pampered while you wait. 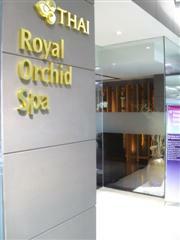 Travelling First Class on Thai Airways entitles you to have the complimentary Spa treatment. You will be served with refreshment in a relaxing atmosphere and you can stay as long as you like inside the lounge. There is no wireless signal in this location so you can watch the TV and pass the time watching the relaxing images of waves crashing on beaches, flying seagulls and flowers swaying in the wind. The most recent concourse map of Bangkok Airport does not show any hairdressing salons, as the one on the third floor land-side has closed now. 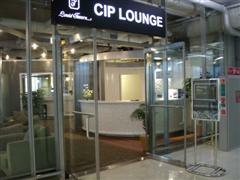 It seems that the only place to get a haircut is in the Miracle Tavern CIP Lounges air-side. Which ever service you decide to use, getting your hair cut is something to pass the time I suppose. So why not pop in for a quick trim and look great on your return home. For the ladies it is certainly one to go and have a look at and see what is on offer. It could be a great use of the time whilst the husband looks after the children. Where can I take a shower in Bangkok Airport? 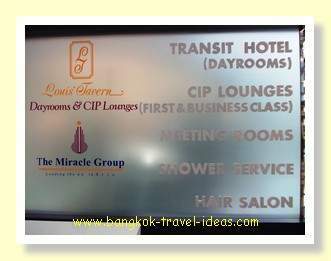 If you make your way to the Miracle Tavern CIP lounges then you will find that they are not set up with shower facilities. The ones to seek out are the Miracle Tavern Dayrooms, as the smaller lounges do not offer this service. Bangkok Airport shower facilities are available for 500 baht in the Miracle Tavern Dayrooms that can be found in Concourses A and G.
If you experience a Bangkok airport flight delay, where your conecting flight is delayed for a substantial amount of time, then there are some areas that have been kitted out with Lazee Boy style reclining chairs. These are extremely comfortable and great if you need to sleep or have a short nap. The chairs are located in Level 3, Concourse C, just past Louis' Tavern CIP Lounge and further along than the Thai Airways lounges. There are also some on Level 4 Concourse B and another block outside the Emirates lounge. Nothing is going to stress you more than finding out that your flight has been delayed. If you need to have a cigarette break then there a number of smoking rooms set aside for smokers. There are many smoking rooms spread throughout the airport, with the majority located at the interections of the Concourses on Level 2. The airport has free 30 minutes of internet available to you on your laptop, so even if you cannot get into one of the airline lounges you can get some short access. If you want longer than this then you need to purchase an access card from WLANNet or maybe if you sit close to an airline lounge you could borrow a bit of their signal. Free internet access computers have also been set up in the vicinity of the Lazee Boy reclining chairs, so really you should have no reason not to check out the most recent updates at Bangkok Travel Ideas. There are about ten terminals in each area, like in the photo above. A lot of people ask what brand name stores are there at Suvarnabhumi Airport, as this is the last chance to pick up a lovely gift for a loved one. Well there are cameras, electronics, jewellery, fashion accessories and alcohol all available at duty free prices throughout the airport. You are sure to find something special in these stores, but if not you will have a great time browsing the amazing selections on offer. At least your Bangkok Airport flight delay is going to give you sufficient time to properly check out all the brand name items on show. Large quantities of liquids are still not allowed on the flights to Australia and the US, so you would be well advised to buy these type of Duty Free goods when you arrive at your destination. 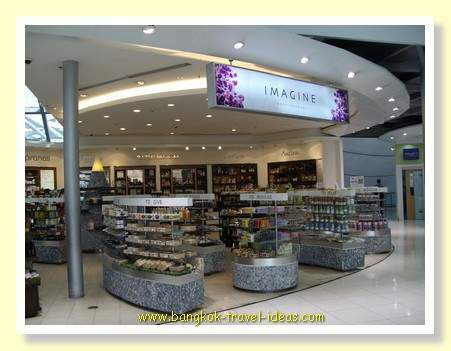 Read more about Bangkok Airport shopping. However, most other countries seem to allow liquids onto the plane, if they are in the specially sealed bags. If buying at Bangkok Airport always check with Duty Free staff before purchasing as these rules can change at short notice. If you are in transit you may find that Duty Free goods purchased at a preceding airport may not be allowed through with you. Many of these rules are inconsistent amongst airports, so you should do some research before you make your purchases. 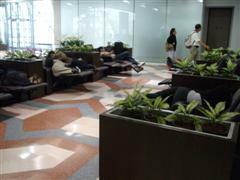 Bangkok Airport has a range of bars and lounges, fast food stores and restaurants spread all through the airport. You are sure to find some food that appeals to you. If you are in transit and don't have any Thai Baht then you should check whether they take credit cards or not before you purchase your food. If not, you won't be the first person turning up at the Currency Exchange booth asking what is the minimum Thai Baht that can be converted. If your flight delay is extensive then your airline should give you Food Vouchers. These can be redeemed at selected outlets; they usually have a sign to say that food vouchers are accepted. A Bangkok Airport flight delay can happen for any reason and it is not unusual for aircraft to arrive late, need mechanical attention or not be able to take off due to bad weather. Sometimes these flight delays can be relatively short, but other times they can extend for half a day or more. So whatever the reason for your Bangkok Airport flight delay I hope that you have enough information about Suvarnabhumi Airport to be able to fill in the time productively. If your flight delay is really extensive (such as when the volcanic ash clouds affected flights world wide) you may be permitted to leave the airport. Whenever there are systematic delays affecting the airlines then there is an increased likelihood of your baggage going astray or being delayed. If this happens you, then read this internal page on how to handle lost baggage related issues and the ensuing compensation mechanisms that can be applied. Whilst a Bangkok Airport layover may not be ideal, it is best to make the most of the opportunity and know ahead of time what your options are.